Turkey is marking the first anniversary of the failed coup. Tens of thousands of people took the streets of Istanbul with many heading to the bridge that became a landmark of resistance after an army faction tried to seize power. President Recep Tayyip Erdogan will unveil a memorial there for the 260 people who died fighting the coup. Some 2,196 were also wounded. The Turkish government has since dismissed more than 150,000 state employees, saying it is rooting out coup supporters. Critics say the dismissals, and a wave of 50,000 arrests, are part of an attempt to purge dissent. The date of July 15 has been declared an annual holiday. Kicking off a series of events that will extend into dawn today, PM Binali Yildirim told a special session of parliament that July 15, 2016, was a “second War of Independence”, following the conflict that led to the creation of the modern state in the 1920s. “It has been exactly one year since Turkey’s darkest and longest night was transformed into a bright day, since an enemy occupation turned into the people’s legend,” Binali Yildirim said. However, head of the main opposition Republican People’s Party Kemal Kilicdaroglu condemned the government’s actions since the coup. Recep Tayyip Erdogan flew from the parliamentary session to Istanbul, in a plane accompanied by air force jets. The president will join the huge crowds on the bridge over the Bosphorus where civilians had confronted pro-coup soldiers last year. It has been renamed the Bridge of the Martyrs of July 15 and the president will unveil a “martyrs’ memorial” there. Istanbul is awash with giant anniversary billboards, with anti-coup slogans strung between the minarets of mosques. President Erdogan will later return to Ankara to address parliament at midnight, the exact time last year it was attacked by coup plotters. He will unveil a monument to the coup’s victims at his palace in the capital at dawn. On July 15, 2016, the coup plotters, armed with tanks, warplanes and helicopters, declared that they had taken over on state media, and bombed parliament and other key locations. 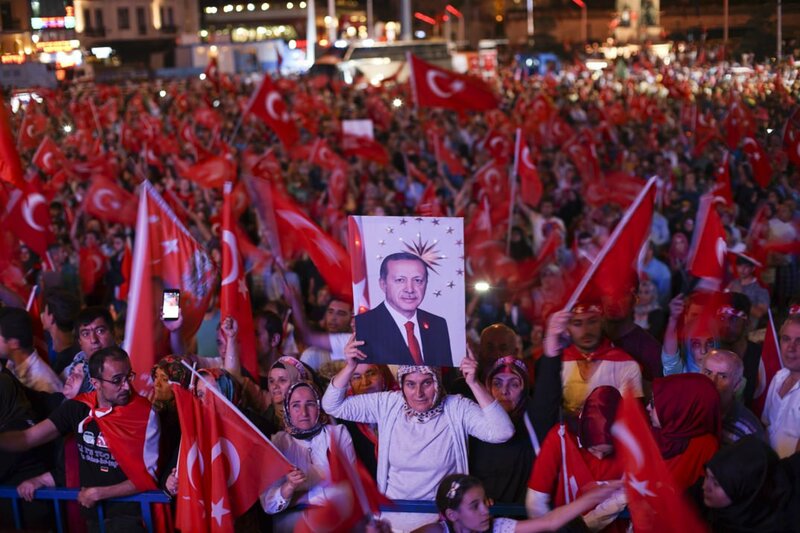 They tried to detain President Erdogan as he holidayed in an Aegean resort, but he had left and the coup was thwarted by civilians and soldiers loyal to the president. The Turkish authorities accused a movement loyal to the Muslim cleric, Fethullah Gulen, of organizing the plot. Fethullah Gulen, who remains in the United States, denies any involvement. Washington has so far resisted calls from the Turkish authorities to extradite him. Critics say President Erdogan is using the purges to stifle political dissent, and last week hundreds of thousands of people gathered in Istanbul at the end of a 450km (280-mile) “justice” march against the government. Recep Tayyip Erdogan accused the marchers of supporting terrorism. On July 14, the government continued its dismissal of state employees, sacking another 7,395 for alleged links to what it calls terrorist groups.